In the bowl of a stand mixer, combine the flour and yeast. Add the warm water and, using a spoon, mix it in just until the flour is moistened and a rough dough forms. Cover the dough and let it rest for 15 minutes.Mix the dough. Place the dough into a large bowl and cover with plastic wrap or a clean tea towel. 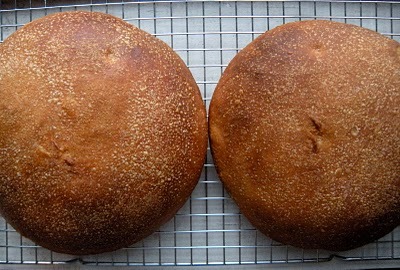 Let dough rise until it has doubled in bulk, about 2 hours, depending on the temperature of your kitchen.Generously oil two 8-inch round cake pans. Divide the dough in half and deflate each, and shape into tight balls. Coat each with oil in the cake pans and cover with plastic wrap. (At this point the dough can be refrigerated for up to 24 hours.) Let the dough ferment until it has doubled in bulk, about 1 hour (2 if it’s been refrigerated).Shape and proof the dough.Remove rounds from cake pans. Shape them into tightly rounded loaves and put them back in their pans seam side down. Oil tops and cover with plastic. (Again, you can refrigerate for 24 hours.) Let dough proof until tripled in size, about 1 hour (2 if it’s been refrigerated). 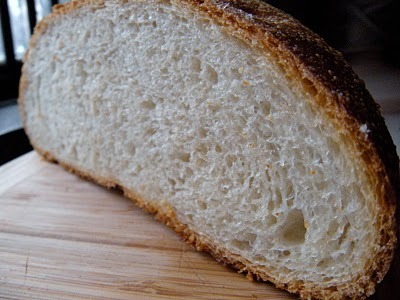 After shaping the dough and while it’s proofing, preheat the oven to 400.Baking the dough.When the loaves have tripled in size and remains indented when gently pressed, lightly oil again, and bake for 50-55 minutes. After the first 35 minutes of baking, rotate the pans so the bread browns evenly. When the loaves are done, they should sound hollow when knocked, remove from the oven and cool on racks.